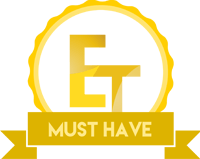 When it comes to PC gaming, not only do you need a half decent PC, you also need a good arsenal of peripherals at your side. 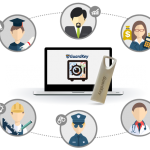 There are many companies to choose from that offering lots of different peripherals. 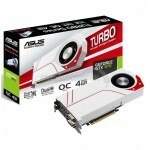 However, it can sometimes be companies that you wouldn’t expect to offer some of the top peripherals on the market. 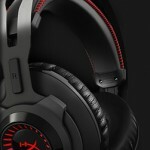 By now, you’ve surely noticed that I am talking about HyperX and their Cloud/Cloud II gaming headsets. Today we will be taking a look at the Cloud II variant which is currently a favourite among gamers. While all peripherals are important, a good headset can help you hear your enemy before they hear you and allow you to get the jump on them. This can be the difference between winning or losing the match, especially when it comes to FPS based games. 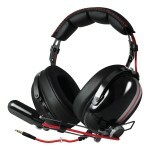 As mentioned, today we are taking a look a the HyperX Cloud II Pro Gaming Headset. 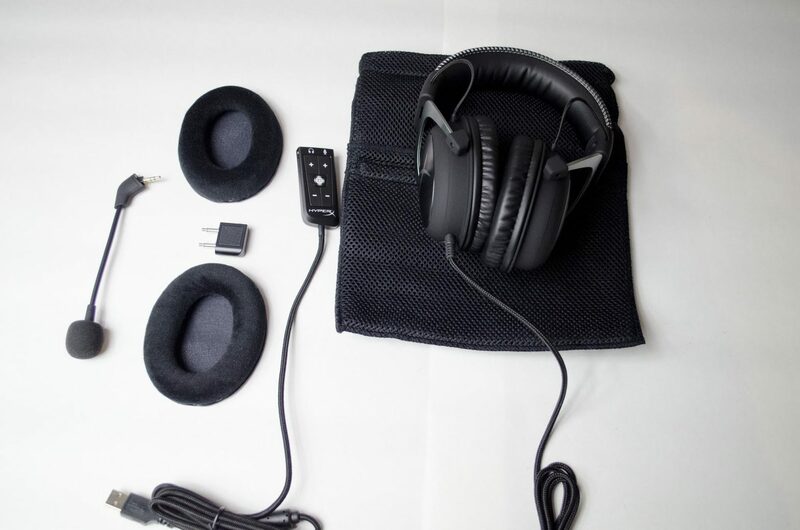 The Cloud II features a USB Sound card, 7.1ch surround sound that really amplifies the sound when you turn it on, a digitally enhanced microphone and 53mm drivers that offer an immersive listening experience. The Cloud II’s come in a few different colours such as black/red, black/gunmetal and even white/pink for those looking for something a bit more fancy! 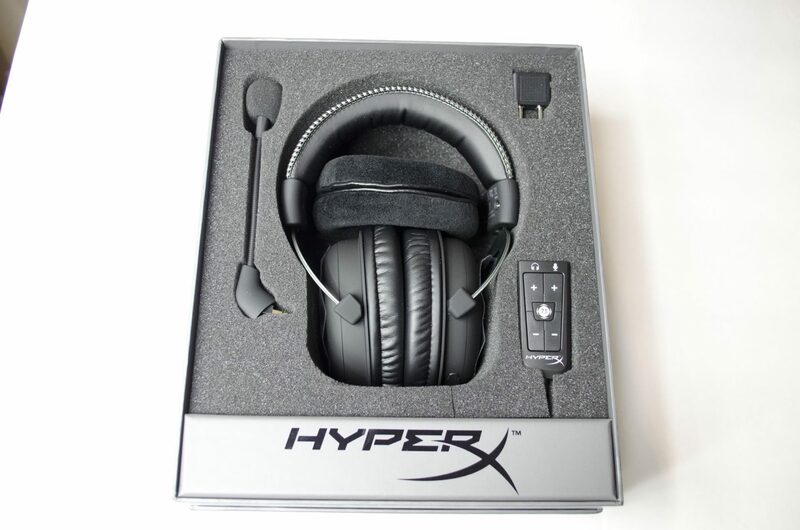 When HyperX first announced the original Cloud headset, many people were a bit skeptical and they had the right to be but fast forward now and these headsets are known for the great quality and being a go to for gamers around the globe. 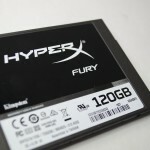 The box for the HyperX Cloud II’s is very well thought out and offers all of the important information that will not only make users consider purchasing the headset, but also help in finalising the deal. The box has a nice red/black theme to it and comes with a great image of the headset right on the front so you know what you are getting. Opening up the box and everything is well packed and protected in foam and has it’s own little space. 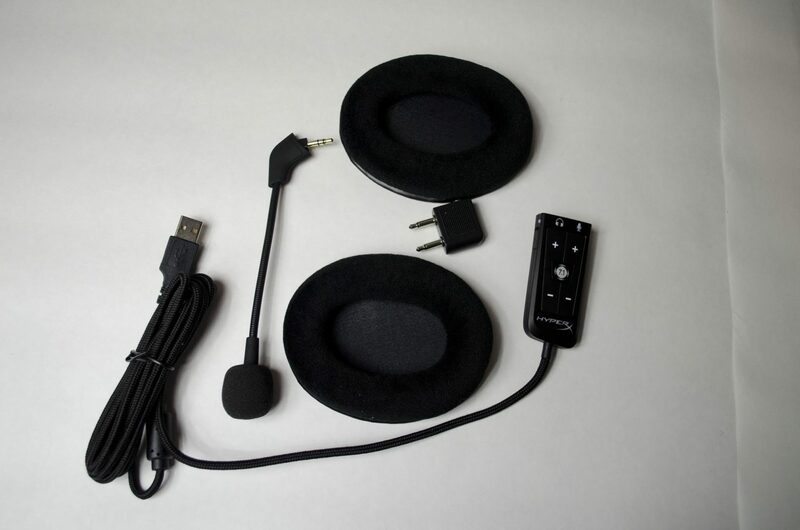 The Cloud II’s are right in the center along with the extra set of ear cup covers, to the left we have the detachable microphone and on the right we can see the airplane adapter and the USB sound card. Getting everything out of the box and we also came across a nice mesh carrying bag to help use keep everything together on our journeys. Not only was I happy to have the USB sound card, I was also very happy to see the extra set of ear cup covers as I am not a fan of the leather type ones for longer gaming sessions. 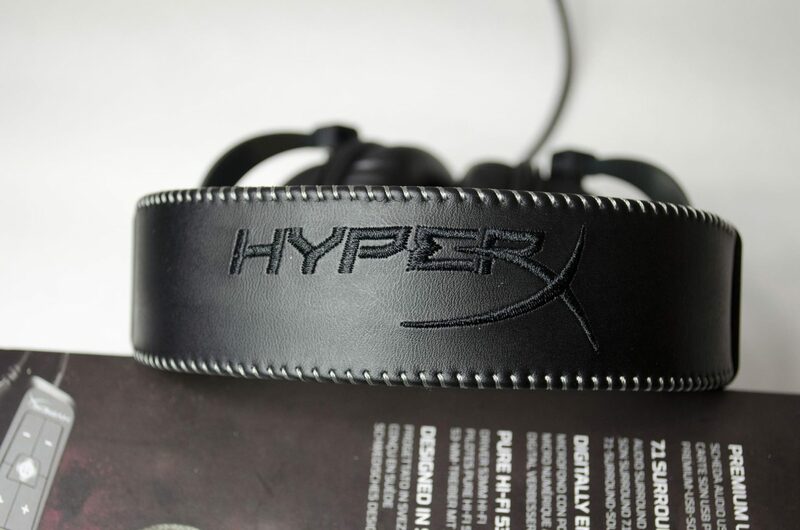 The outside of the headband features as stitched leather look then the HyperX logo embroidered on it. This helps to give the headset a bit of an extra quality feel and really does help to compliment the rest of the headset. On the inside of the headband is a nice and thick foam padding so users can enjoy these for longer periods of times without being caused any discomfort. 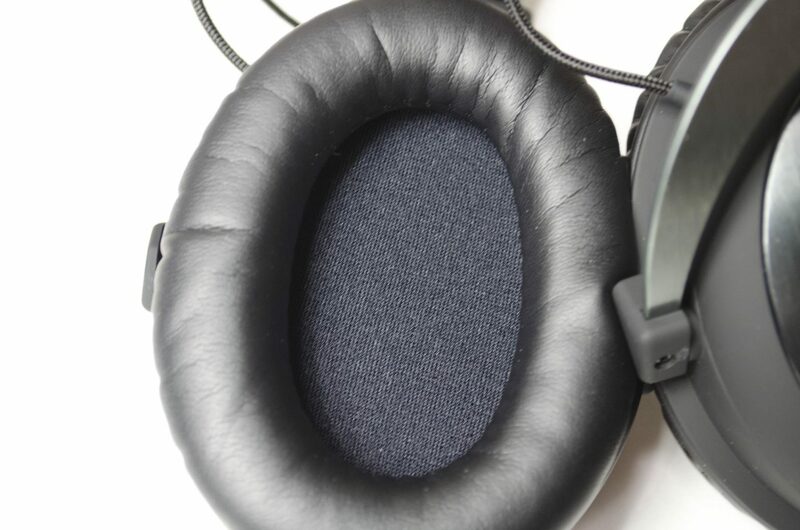 The earcup padding is also quite nice and thick and again, offers great comfort for longer periods of time. As we saw, HyperX has included both a leather and cloth type ear cup to make sure they can please the masses which plays in their favour when it comes to my overall opinion on the headset. The earcup pads are easily removed and believe it or not, putting the other ones on isn’t all that hard. Just start at one end and work your way around and it won’t take you any time at all. 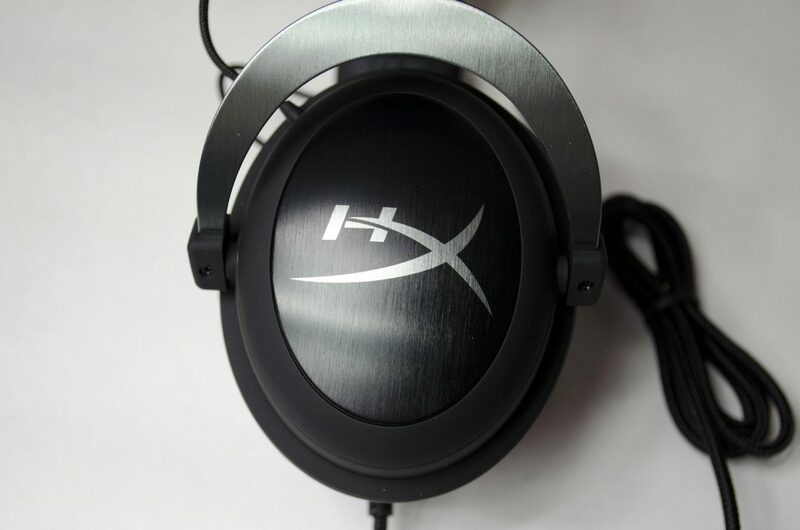 The outside of the earcups features a nice black brushed aluminium look with the “HX” from HyperX logo on it. This allows the Cloud II’s to offer and elegant style while still giving off a “gamer” vibe which is very pleasing to see. 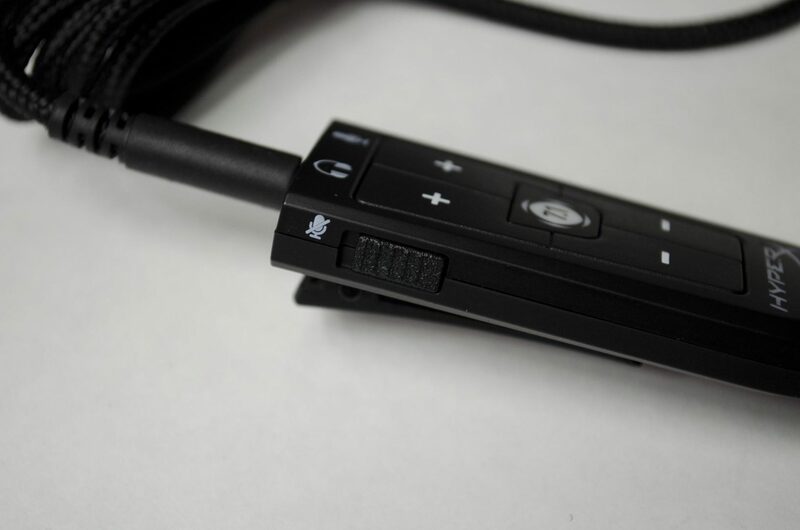 The little rubber flap that protects the MIC input when the MIC is not in used is easily pulled out and can also be just as easily reinserted when not using the MIC. On to my favourite part of the headset, the USB sound card which is also features come controls as well. 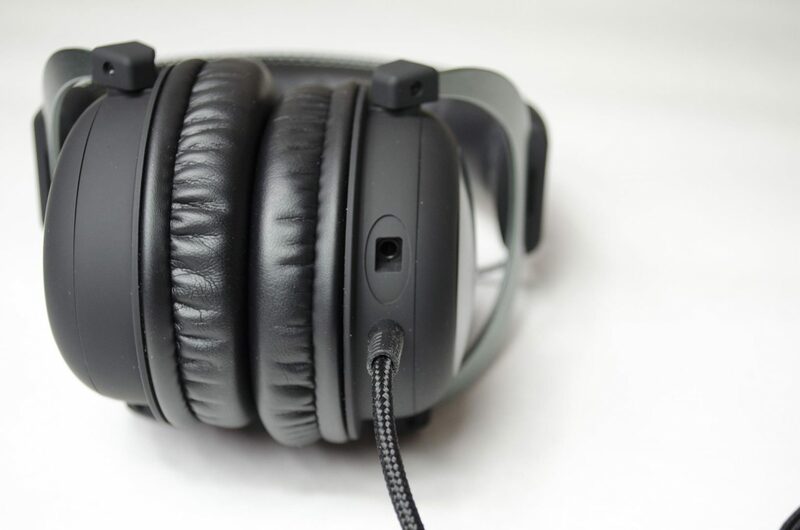 The Cloud II’s by default feature a 3.5mm jack which plugs into the top of the USB sound card. Once plugged into the sound card, users can hit that lovely 7.1 button right in the middle and crank up the volume. When using this sound card, the Cloud II’s offer some of the best sound for music and in-game I have ever heard from a gaming headset. You will also notice there are volume controls for both the headset and even the microphone right on the sound card which make life nice and easy. 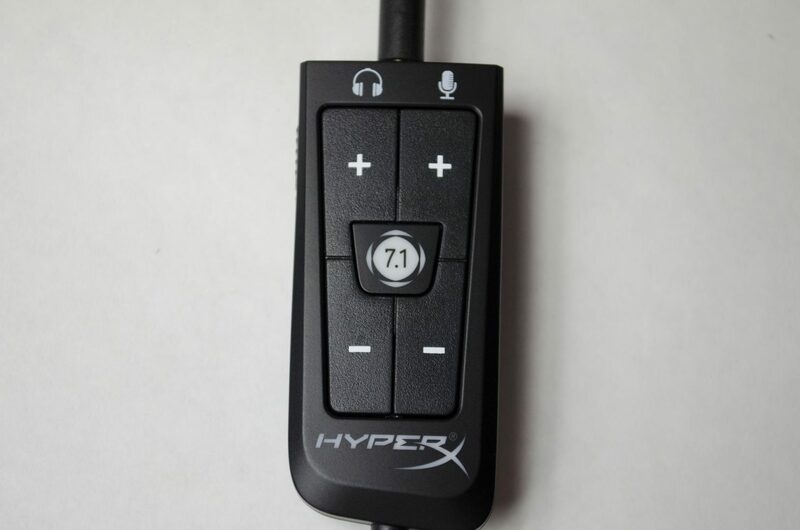 For those times when you need to mute the mic to tell your Mom/Wife that online games can’t be paused, HyperX has included an easy to use switch that will mute the MIC for as long as you want while still allowing for sound to be played through the headset. 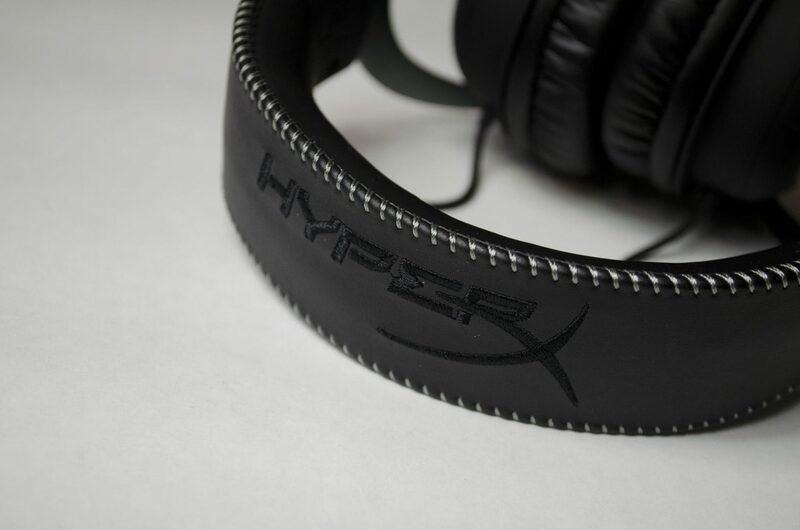 In keeping up with gamer’s demands, HyperX has made sure all of the cables featured on the HyperX Cloud II’s come braided. 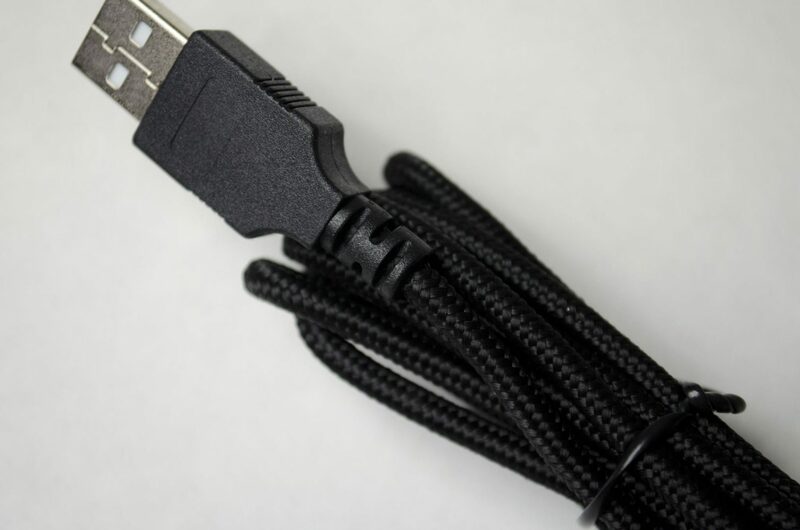 Not only do braided cables offer a pleasing aesthetic, they are also a bit more durable than the standard rubber insulated cables. As I am sure you can all imagine, once I got these bad boys I couldn’t wait to test them out. The Cloud II’s are something I have wanted since they came out and had finally gotten my hands on them. 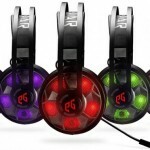 It’s also worth noting, that while I used them on my Gaming PC, they are also compatible with MAC, PS4 and Xbox so make a great all around gaming headset. The biggest benefit I found was the 7.1 button on the USB sound card. Hitting this opens up a whole new immersive listening experience that is just truly amazing for both music and gaming. 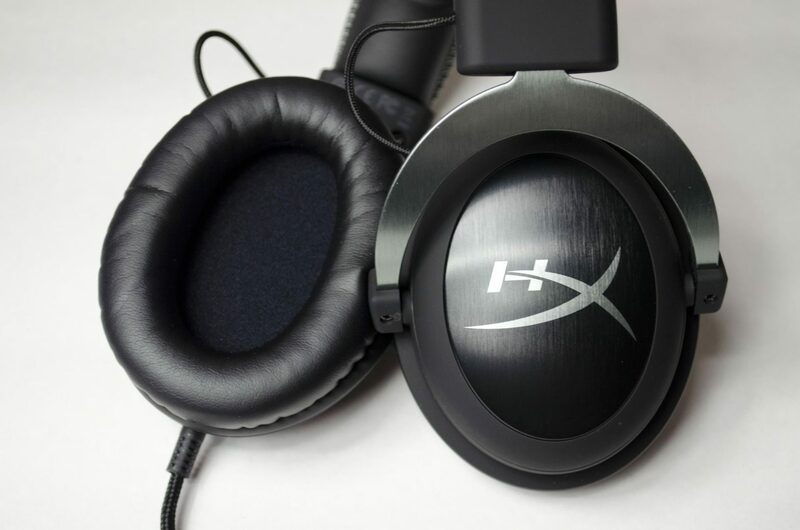 The first thing I did was play some of my favourite Hip-Hop and Dance tracks to see what kind of listening experience I was in for and oh my, the HyperX Cloud II’s didn’t disappoint. There was a nice deep bass and the mids/highs were right on point as well, with virtually no distortion at all, even when cranking the volume up as high as my PC would let me. 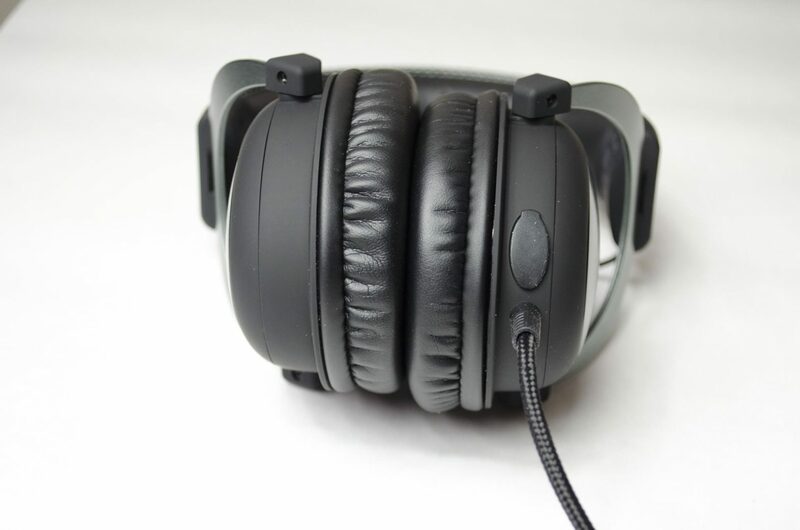 While there may be better headphones suited for a purely music environment, these are actually designed for gaming but do offer great all-around performance. When it came time to load up my favourite FPS games, I couldn’t have been happier with the Cloud II’s. One of the first things I noticed when gaming was the bass of the footsteps. I could hear my enemies/teammates from further away than normal and could also better judge when they were getting closer. It’s actually quite amazing would a good pair of 7.1ch surround headphones can do and that USB soundcard seems to make all the difference. Coming from my previous headset, these were a big upgrade and really did make me feel as if I was actually immersed in the middle of the sound which is something I had never properly experienced before. When it comes to the microphone, as far as I was told it is very clear and there is no distortion or horrible noises coming from it when using it. 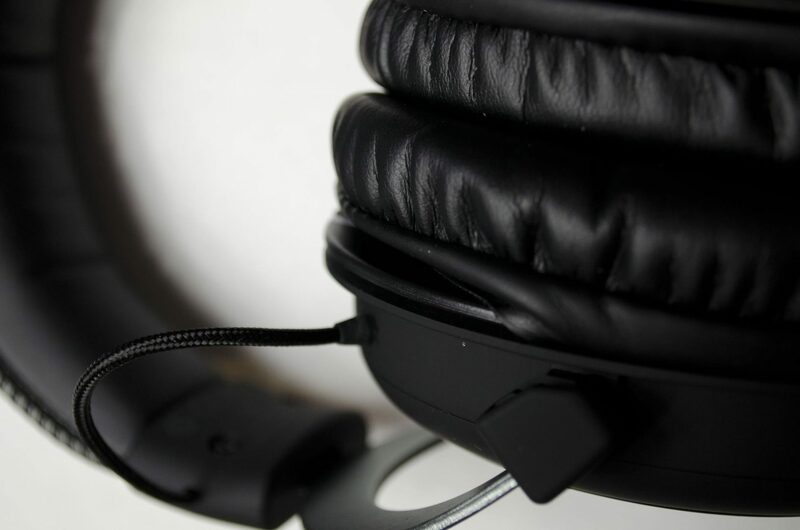 While the MIC may not be the most important part of a headset, there is nothing worse than being in voice chat with someone who has a horrible MIC that is either crackling all the time or hissing at you. Testing peripherals is probably currently my favourite aspect of being a reviewer, especially when it comes to the in-game testing that needs to be done. I also love seeing what different manufacturers do to help better their peripherals, or what they offer different from others to help try and draw more attention to their products. eSports is still on the rise and as such, we are getting flooded with loads of peripherals, which is OK with me. I’ve been using the HyperX Cloud II’s for about 3 weeks now and it is finally time to wrap up the review on them with my final thoughts, so let’s do it. 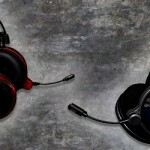 Overall, the Cloud II’s offer a great user experience, both when listening to music and in-game. There’s a nice deep bass that was lovely for my hip-hop and dance tracks, as well as allowing me to better hear footsteps in FPS games. Being able to better determine where my enemies were based on their footsteps proved to be a very handy and helped give me the upper hand in matches. 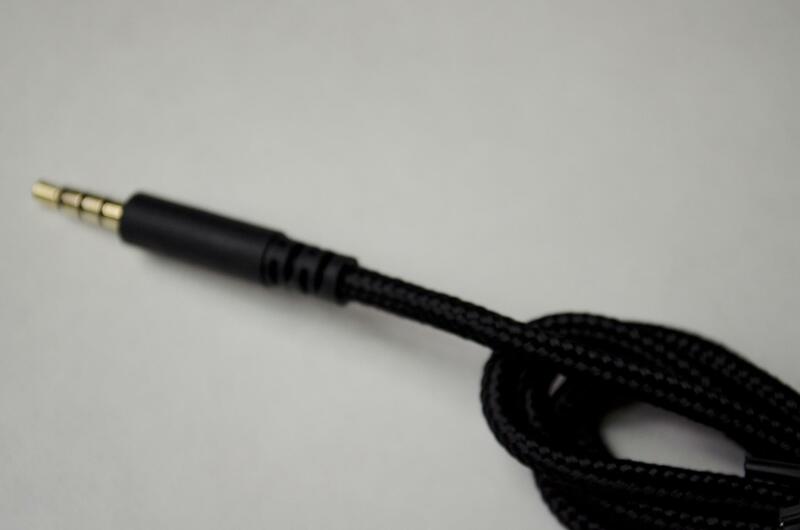 For those looking to make use of services like TS3 and VOX, the detachable MIC offers a clear and responsive sound. My teammates had no problems hearing me shout at them over TS3 and a few of them did comment on the fact that the MIC I was using is much clearer than my normal one. Overall, the Cloud II’s offer great all-around performance which is a pleasure to see from a gaming headset! 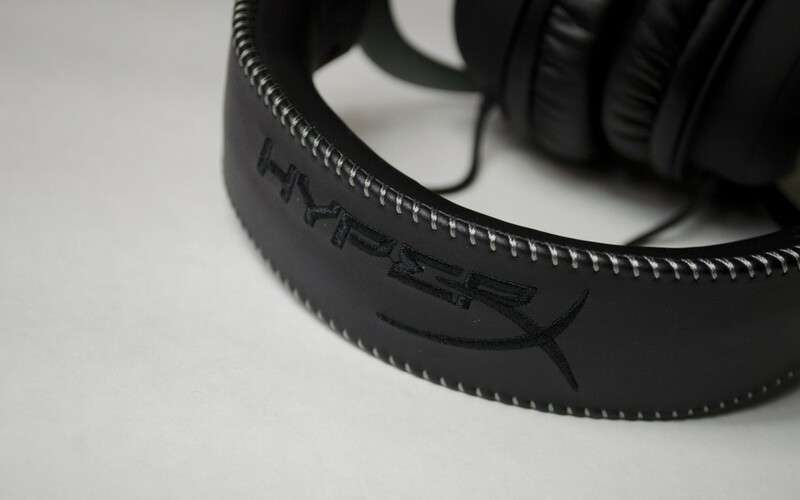 The HyperX Cloud II’s are clearly designed offer a pleasing aesthetic and performance. Just looking at them and you can see they represent good quality and comfort. Wearing these for hours on end is almost too easy and comfortable as you just forget you are wearing them after awhile. 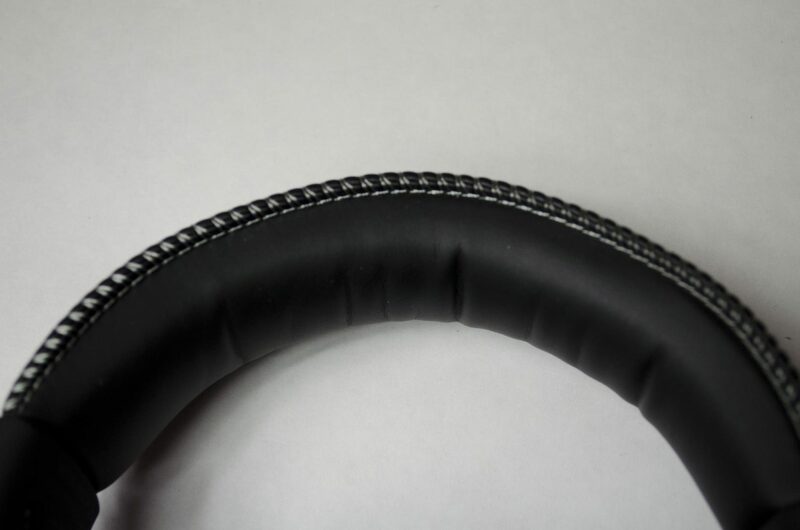 The leather stitched outer headband couple with the nice foam padding on the inside is just great to look at and feel. Not only is this headset designed to look great, it’s also designed to offer some amazing performance. When you combine the 53mm drivers with the USB sound card, you really have a great listening experience on your hands. That 7.1 button on the USB sound card is really like kicking things into overdrive and just takes the sound coming out of the headset to the next level, one that will be welcome with open arms. For a company that used to only be known for manufacturing RAM, they have certainly done a great job on their second implementation of creating a true gaming headset. Coming in at around £75 from our friends at Ebuyer, the HyperX Cloud II’s are easily one of the best gaming headsets and represent a well-worthy purchase. While primarily designed for PC gaming, they are also compatible with PS4, Xbox and even come with an airplane adapter so you can take them with you on your travels. 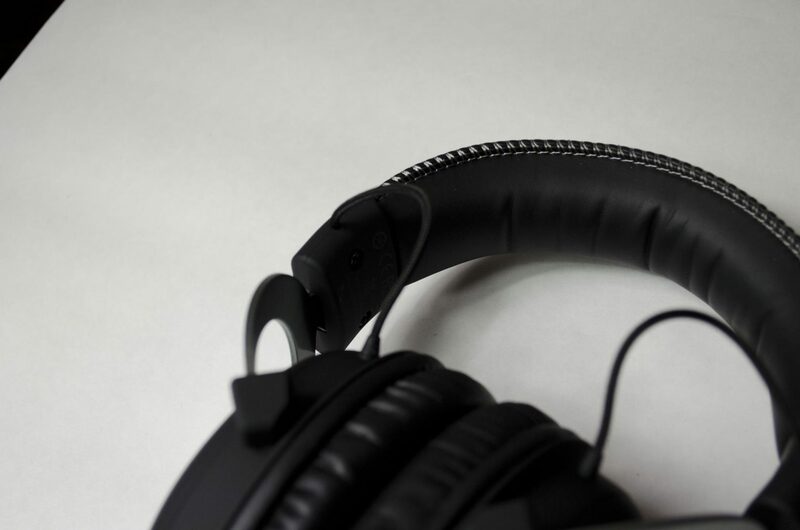 For the money, you are getting a headset that represents quality, both in looks and performance and the 2-year warranty offers a piece of mind. 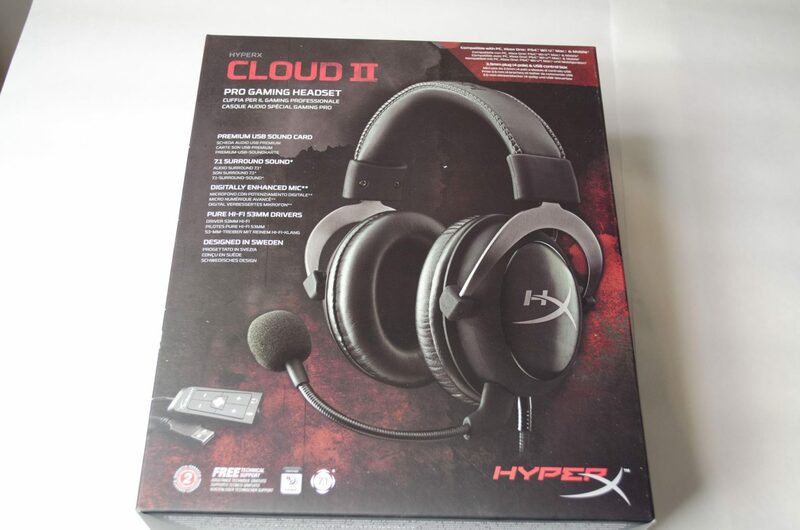 Many thanks to HyperX for sending their Cloud II headset for review!